1. Preheat the oven to 200˚C, gas mark 6, and put a heavy baking sheet in the oven to heat up. Make the pastry: whizz the flour and butter in a food processor until it resembles breadcrumbs. Add the sugar and allspice and whizz briefly again, then add the egg and 1 tbsp water and whizz until the mixture holds together. Knead lightly on a clean work surface, then divide into 8 portions. 2. You will need 8 individual fluted tart tins, 12cm in diameter and 2cm deep (or 14 x 8cm tart cases will work, with 14 pastry portions). Gently roll out a portion of pastry on a lightly floured work surface into a 16cm circle (adjust if using smaller tart cases). Use to line a tart tin, pushing the pastry into the fluted edges, then trim. Add the trimmings to the other pastry portions. Repeat until all the tart tins are lined, then prick the bases with a fork. 3. To make the filling, put the butter and sugar into the food processor and whizz until creamy. Add the eggs, ground almonds, flour, spices and treacle and whizz until smooth. Spread a spoonful of mincemeat onto the base of each tart. Divide the filling equally between the tart tins, and lightly level with the back of a spoon. 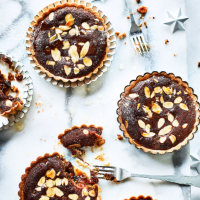 Sprinkle each tart with a few flaked almonds and transfer to the preheated baking tray. Bake for 20-25 minutes, until risen and golden. Remove from the oven and drizzle each tart with a little stem ginger syrup. Leave to cool slightly in the tins, then remove and serve warm, dusted with icing sugar, if liked.